The temple of Amon at Karnak, together with its outlying buildings is a natural museum of ancient Egyptian art, a blueprint of the power and glory of a golden era and a mine of historical information. Beneath its giant architraves and between bulky column and wall relief lie the records of its growth from a modest 12th Dynasty shrine to a local deity, to a temple of splendid and unimaginable proportions dedicated to the King of Gods, Amon-Ra. It owes a colonnade to one Pharaoh, a pylon to another; an inspiration here, a whim there. But each has the sole purpose of pleasing the god that would ensure them a life long, powerful and glorious. Unravelling the secrets of two thousand years has been a major feat of Egyptology, made the more difficult by the fact that architectural magnificence did not necessarily run parallel with military or civic excellence. Family rivalries and kingly jealousies were as often the incentive behind a construction as creative inspiration. One cannot help being amused for example at the oft-repeated tendency of the reigning Pharaoh to alter the royal cartouche of a predecessor and so take the credit for all the work he accomplished. To add to the confusion, some parts of the buildings were raised from dismantled shrines or the walls of other temples. 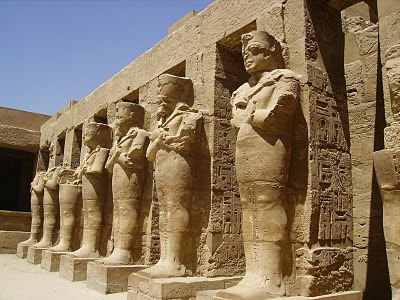 In addition, Karnak had twice to endure the degradation of Amon, at the hands of Akhenaten and of the early Christians. An idea of the complexity of the task may be gauged when we learn that in the core of Amenhotep Ill’s monumental third pylon "[®re buried blocks of ten structures of earlier periods; that a valuable historical inscription on how Kamose conquered the Hyksos a period about which very little is known was found text-downwards beneath a statue of Pinedjem which had been buried in the foundation of the second pylon of Ramses II; that both Ramses an Seti I used blocks from Akhenaten’s sun temple for their large-scale additions to the temple; and that Haremhab crammed his ninth pylon with thousands of inscribed sandstone blocks from this same heretical’ era. Thutmose I, who ascended the throne at the beginning of the 18th Dynast}', actually made the first major alterations to the original shrine. He had two colonnades and two pylons built (Plan 6 P.4 and P-5). Between the latter, Hatshepsut, his daughter and builder of the magnificent mortuary temple of Deir el Bahri (page 75), erected a pair of huge obelisks. She also made some alterations to the side of the sanctuary. These were continued by her co-regent and successor Thutmose III. Though Thutmose III showed less interest in perpetuating his memory in impressive monuments than in creating an Egyptian world empire, he did build a festival temple (page 54) to the rear of the sanctuary, surrounding it with a girdle- wall, on the inner side of which were a number of small chambers. It was Amenhotep III, builder of the temple of Luxor, who altered the front of Karnak temple. He raised a new pylon (Plan 5 P.j) in front of that of Thutmose I, but, impressive though it must have been, it was to be eclipsed by the additions of the 19th Dynasty. Ramses I erected the second pylon during his one year in power. 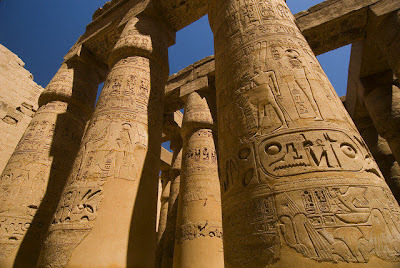 Then his son, Seti I, started the construction of a huge hypostyle hall between the pylons of Ramses I and Amenhotep III. This work was continued by his successor Ramses II. Always going one better than his ancestors, Ramses II also built a second girdle-wall outside that of Thutmose III and with it the Great Temple of Amon had almost received its final, magnificent form. It was now officially and justifiably styled ‘The Throne of the World’. Seti II and Ramses III had two small separate temples built in front of the great complex. In the 22nd Dynasty under the Libyan kings of the Bubastides these were incorporated into a huge colonnaded court in front of the pylon of Ramses I. In the 25th Dynasty Taharka the Kushite also erected some gigantic columns in this court. The last addition to the temple, its entrance pylon (Plan 4 P.1), was erected in the Kushite Dynasty.